We’ve already welcomed 2013 but it’s only about to arrive this weekend based on the Lunar calendar. With Chinese New Year just around the corner, I figured I’ll wear something inspired by the occasion to help you decide what to wear come February 10. Polka dots–lots of them! They’re shaped like coins which is why the Chinese believe they bring in good luck for the New Year. It’s like you’re wishing for lots of money and success for the year ahead. I got my polka dot top from My Everyday Fashion, a local online store that I recently discovered. They have so much polka dot tops and more! Red is also believed to be a color that brings in luck so I made use of the color as well. Not only are my shoes, bag and lipstick red but so is my hair! DUN DUN DUN. (That’s my lame attempt at making some sort of sound effect. Please accept me for who I am. LOL.) My red hair has finally made its official debut on my blog! Woot! Now whoever said Crocs can’t make cute flats must’ve never seen these. P.S. Since we’re already talking about the Chinese New Year, if you have nothing to do on the 9th, drop by Lucky Chinatown Mall. I helped my dad’s association with their Chinese New Year festivities in partnership with Lucky Chinatown Mall. My friend Haze and I styled a short fashion show that starts at 7pm. You can walk around and enjoy the other activities and booths set up there as well! Super love the crocs! I’m planning to buy them soon! :) Loveee the outfit. Ohh my! your so pretty! mababaliw na po ako sa kagandahan nyo! oh by the way, thanks for replying to my email.. thanks for your advice, i appreciate it much that you replied :) yes i wore a black dress at that friend’s 25th wedding anniversary and yeah, i was stunning ( they said) hahahaha!.. my apprehension vanished when i saw the wife ( couple celebrating wedding anniversary) wearing ALSO a black dress! hahaha! you look perfectly amazing with your red hair. … because every girl needs pink in her closet! First photo is absolutely stunning! Shoes, shoes … I want these shoes! Happy Chinese New Year! Love your look – as always. :) This reminds me – a bit – of Jap fashion. Maybe someday you could post something like the photos in this site — http://www.japanesestreets.com. I’m just really curious to see your take on Tokyo street fashion (I mean, the really out-there kind). You look very pretty here :D Dalagang dalaga ka na ohh :D with matching RED hair and lipstick :DD Pretty much ! OMG!!! I super love your red hair — made you look more fierce yet sultry plus ++++ elegant pa lalo! anyways – nobody mentioned about how great your lipstick color is here. it complements your mane very well. you should wear more reds, coz i isually see you in pink or peachy lippies. BTW, what brand and lipshade are you using here? I’ve been waiting for your red hair! Finally. :) You look beautiful. And i love your outfit. I knew it was Crocs because of the holes sa side! Gone are the days of ugly duck style crocs and Hello to the more stylish ones! I got a really nice pair in HK… ;) Anyways, ay nakoooh I love your haaair! Thanks Reena! :) Yes gone are those days! but i already went to watsons but they said they don’t sell that product. What branch do you go to? Oh it was a long time since I last bought it maybe they discontinued it? Yay!! I’ve been waiting for your red hair!!! you look gorgeous with your red hair, Ms Camille!! <3 I think i might dye hair red too! but not now.. and I love that polka dot top! I I recently also bought a polka dot peter pan collar tee!! and I'll wear it on the first day of Chinese new year for Mass! =) but I bought it because it's cute! cuz I don't really know the meaning of what represent what.. haha.. so much for being half Chinese.. haha.. and also the red ballet flats are adorable! I didn't know it's from Crocs..
and I would like to wish you Happy Chinese New Year in advance! May God bless you & family with good health, wealth, and prosperity! and wish you have more new reader in 2013! May all your dream come true! Thanks Wrey! Kung Hei Fat Choi! I love your outfit especially the skirt! I must try this out :)) thank you Miss Camille for this outfit suggestion. yay! Hi camille! Where did you had your hair dyed? What shade? hehe I just love your color! DIE!!!!!!! Matibay talaga! :) Thanks Abi! Lalong na emphasize ang pagiging Chinese mo Miss with your make-up..:) And as always, you’re so pretty. ‘Crocs ballet flats’. (moved on) ‘Now whoever’…(wide-eyed) WHAT? THAT WAS FROM CROCS? are you chinese or a half filipino a half chinese? Sure! :) Thanks Jevey! Happy Chinese New Year to you too! wow. what’s your nickname po? dapat your nickname is “pag-ibig.” more power and success this coming Chinese new year po. Thanks Emmrose! Happy Chinese New Year! Maybe not green haha! Thanks Issa! This is so ladylike & I love it! May the red hair bring you good luck this year Ms. Camille :) Happy Chinese New Year in advance! I love your flats! By the power of my red hair! Haha! Thanks Nelayish! Happy Chinese New Year! That’s 1 super cute flouncy skirt! And for a second there I thought you were wearing a toe cap with bow flats from H&M [I’m wearing mine right now] but when you credited crocs, I was like WOAH! For real?? Crocs have cutie shoes too? I think crocs products are comfy and adorable, but they’re too manly for my taste, but this 1 is a shocker haha… hmmmm maybe I should get my hands on these babies too..
You look so young and girly in this outfit! Very pretty as always. Thanks Ohms! I wonder how many I have as well haha! Dun dun dun! Haha! Love your humour Camille! Haha glad you appreciate it! :) Thanks Janice! happy new year :)))) ♥♥♥ nice outfit by the way dear!!! Haha but I love Betty more! :) Thanks Clarizza! I must say I’m in love with this look. The Aldo necklace is my favorite piece! 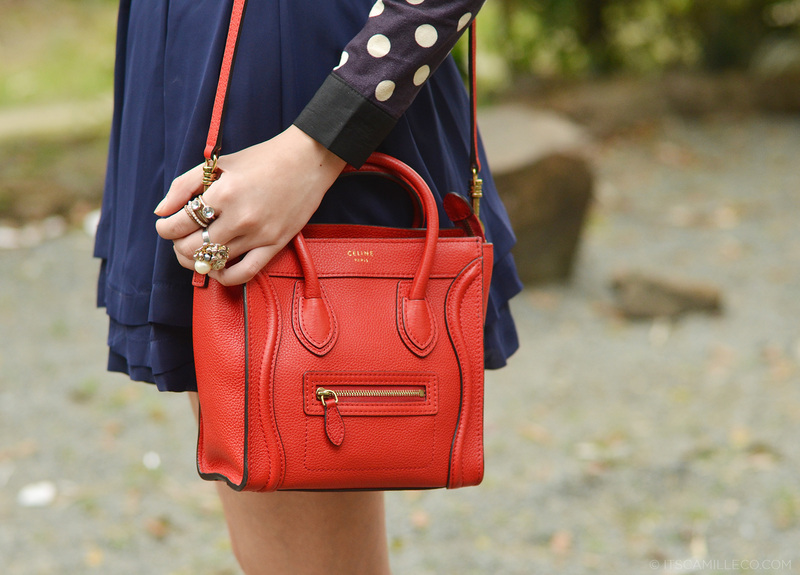 polka dot and red – PERFECT! Lovely! I love the saturated blues and deep reds; it really embodies the Chinese new year colors. I love ur outfit. Very nice and ur red hair is so lovely. Your hair! Wow, you look more mature and sassy (: Can’t wait for CNY! and you always stunning as usual..
Love your bag and love your new hair colour…what do you think about my new hairstyle? Thanks Marie! :) I think it’s so badass! wow. Finally, it’s red!!! love the hair. and your outfit also. pretty. Wow nice red hair, it matches your bag and flats. i love it!!!! Hi, Camille! I really love reading your blog also I really like your fashion sense. :) by the way, will you be at the Lucky Chinatown Mall on 9th? Cause I wanna have a picture with you. :D Thanks! Is your air getting red-er every time I visit your blog? =)))) Soooo cool! Like Emma Stone! Sooo pretty!